Sweet Corn and Bell Pepper Salad is one of the easiest and healthy Salad which can be done in minutes. It tastes simply GREAT. Bought this Sweet Corn to try out a dish which is served in Indian marriages. But ended up with this equally awesome salad. Had lots of Bell Pepper ( Capsicum) lying in my fridge for days and wanted to finish it off. So added those to this Salad and a new tasty Salad was born. 1. 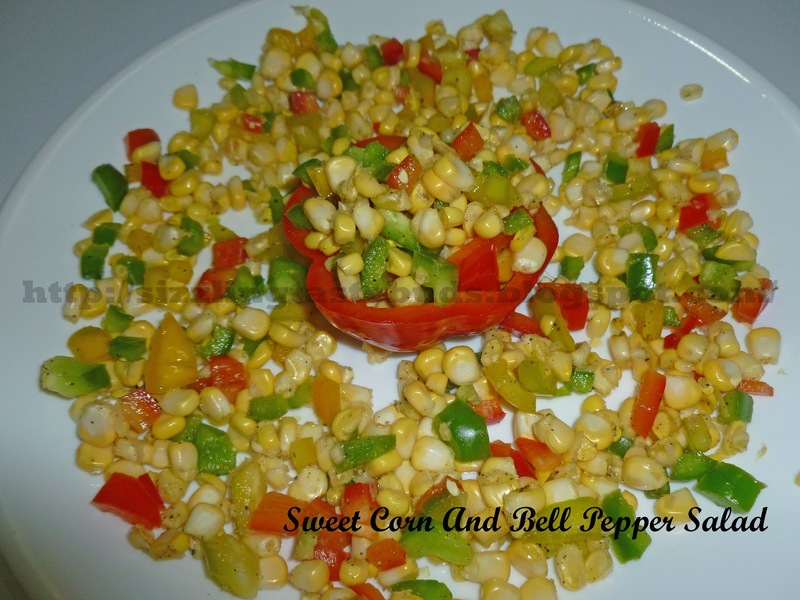 Take Sweet Corn and chopped Capsicum in a wide bowl. I used red, green and yellow Capsicum to make it more colorful. 2. Add Salt to taste and pepper powder.